With a retail price of $125 CDN ($92 US) one shouldn't really expect many features, and the NF7-M is pretty barren in fact. 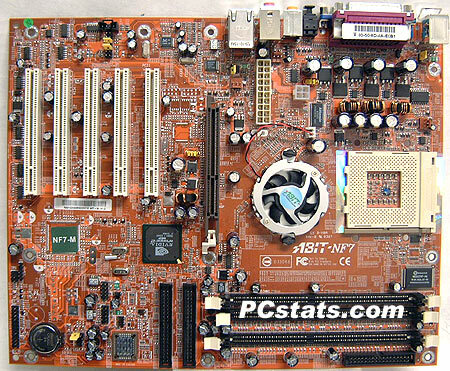 Equipped with only 10/100 LAN, 5.1 audio and an integrated GeForce4 MX the board really doesn't offer all that much. Still with what you save with the board you can put it towards other devices and the NF7-M is pretty upgradable with its five PCI slots. We were happy to not just see an active cooler on the nForce2 IGP Northbridge but that Abit used a good amount of thermal paste instead of those pesky thermal pads. The main ATX and ATX12V power connectors are located in a decent spot right next to the MOSFETs. That means that your processor will some nice steady voltages which should improve stability. Abit also did a very good job at clearing out the CPU socket area of obstructions and with the four mounting holes you should be able to install even the largest of heatsinks on the market! 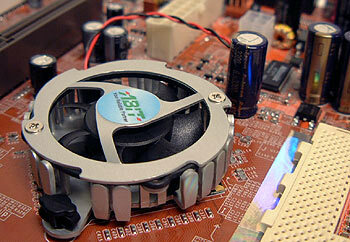 The layout of the NF7-M is not as good as previous Abit motherboards. Probably the thing that bothers us most is the location of the IDE connectors. Placed just under the DIMM slots they could interfere with longer AGP videocards (like Ti4600's) and would require you to wrap the IDE cables around which can cause your expensive videocard to easily overheat! The Abit NF7-M is a performance motherboard and for those die hard overclockers who voltage mod and TEC their videocards having an integrated one may not be a bad idea when disaster strikes.